To kick of the month a selection of tunes reissued on the Pressure Sounds label. Have a mad show Ital... Wanna spin with me on Sunday at Dub Club? What time you playing? Would love to. Was hoping to get along in any case. Last week it was the Ambassador at the controls. Tomorrow it'll be me along with Robojase from Bass Culture Radio. 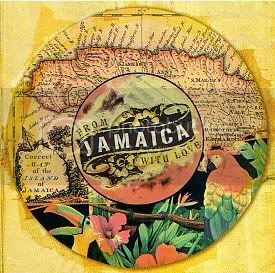 Largely a showcase of the Hardwax 'From Jamaica With Love' releases. Week after that will be another fine selection from Social Living. Inna station now... feelin irie and with a bag a records to pound the airwavez! Hey thanks for saving my arse there at the start and covering me. God I hate a work day that spirals out of control. Anyhow show was a lot of fun and more than made up for it. This weeks show will be another (much appreciated) selection from Social Living. Tune in if you can, and I will link any online availability from here too. Hope you put it up later, sounds good! Can you record the bassculture tomorrow, and drop Ibojah's promo? Also bro, you hitting up Dustones tonite? Seeya there I hope! Yep will air Ibojah's promo. Picked up a whole lot of vinyl last week. Reissues on Kingston Connexion, Reggae Goldmine, Trojan and many others - plus a few more contempoarary tunes and re-licks. In short will have more good music on me than I will have time to play - my fav prob. Do you record this one? Looks like a real nice show... & I'm very interested to hear the Michael Manley one.